Candidate must possess Professional License as Certified Public Accountant; With at least 30 years work experience in Finance-General / Cost Accounting or equivalent. Requires excellent working knowledge of the Microsoft Office Suite, specifically Excel, including sorting, formulas, formatting, quote templates and macro definitions; advance in MS Office (Word, Excel, PowerPoint), Outlook, and ERP systems; Solid understanding and familiarity with AX or similar product database / ERP systems; Level 5 (excellent working knowledge) Speaking / Reading English language is required; requires the ability to deal effectively and professionally with internal and external customers; Superior organization and administration skills, ability to work autonomously; Ability oriented and excellent level of accuracy. Tertiary Education in Graphic Designs; With at least 2 years or in-house digital marketing and web design experience; Demonstrated experience in web content, video and photo editing; Demonstrated experience in working with a team; Excellent knowledge of Adobe Creative suite; Possess an understanding of advertising campaigns; Knowledgeable in video and phot editing; Ability to build solid relationships with customers and handle enquiries professionally; Excel at research, possess excellent online writing skills and the ability to deliver editorial and technical writing output; A passion for photography and videography; Good oral and written communication skills; Ability to work under pressure, balance the competing demands, work to deadlines; Excellent level of integrity. Bachelor’s Degree in or related field preferred; Minimum 5+ years MS Excel experience in similar role or capacity; Intermediate to advanced skills in Microsoft Product Suite; Must be familiar in concept development (mood boards, material board), production of contact documents (schematic design, design development, construction documents / working drawings); In-depth knowledge of furniture systems and finishes; In depth knowledge of CAD systems and software; Must have a strong and established network of both related and non-related contacts who can assist in providing valuable intel as well as being able to put you in contact with the right people to be able to source the information required to achieve desired outcomes; Have excellent verbal and written communication and presentation skills; Be personally energetic, dynamic, positive, enthusiastic and possess the ability to think laterally and act through reasoned decision making. A graduate of Computer Engineering or Computer Science or IT related course; Has experience in programming using Visual Basic.Net and MySQL; Knowledge in C# and PHP is an advantage; Good interpersonal skills and outstanding work ethics; Must be flexible and efficient in handling multiple tasks. A graduate of Computer Science or any Computer related courses; Has background in multimedia and database management tools, and web application tools; Customer focused; Good organizational skills and excellent English communication skills; Good interpersonal skills and outstanding work ethics; Must be flexible and efficient in handling multiple tasks. Male; Graduate of four year course; With at least (1) one to two (2) years in Warehouse supervisory experience, Dynamic, customer service oriented and flexible. Male; Graduate of BS Computer Engineering, Pro-active, Flexible and Adaptive; Can perform with minimum supervision; Fresh graduates are encouraged to apply. At least 4 years of progressive leadership experience in HR positions; specialized training in employment law, compensation, organizational planning, organization development, employee relations, safety, training, and preventive labor relations, preferred; Active affiliation with appropriate Human Resources networks and organizations and ongoing community involvement, preferred; Excellent oral and written communication skills. Candidate must possess at least a Vocational Diploma / Short course certificate; Must have minimum of 2 years’ experience in the same capacity; Ability to work with computers and software such as Microsoft Excel, as well as data processing skills, are valued; Good Communication skills to deal with people internal to the company as well as with suppliers. Male; High School graduate; Hardworking and flexible. Female; At least High school graduate; Can work with minimum supervision; Attentive; Trustworthy. 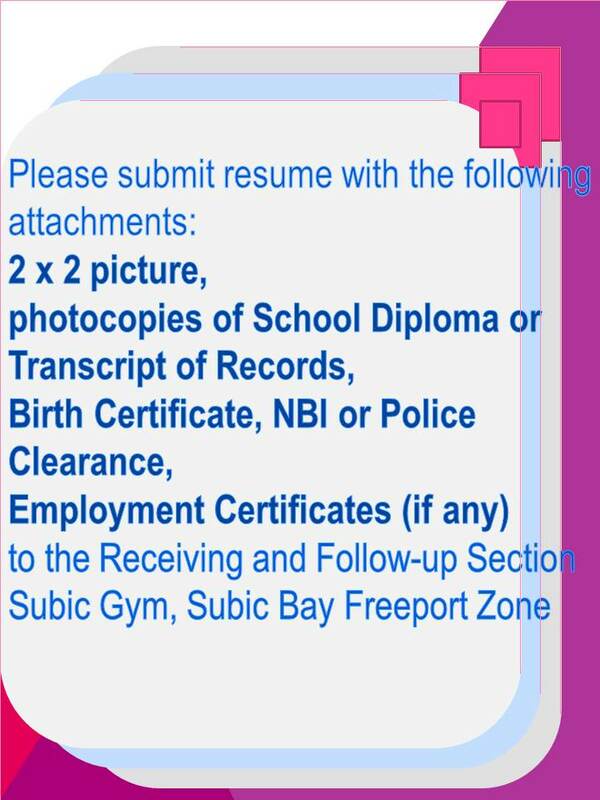 Applicants are advised to register at the Receiving Section, Subic Gym on/before JULY 10, 2017 before proceeding to the Wistron Infocomm (Philippines) Corporation located at #4 Rizal Highway corner Aim High Avenue, Subic Bay Gateway park, Subic Bay Freeport Zone, from Monday to Friday, 10:00am (Exam) and 1:30pm (Interview) and look for MS. CRISTINA LIM.